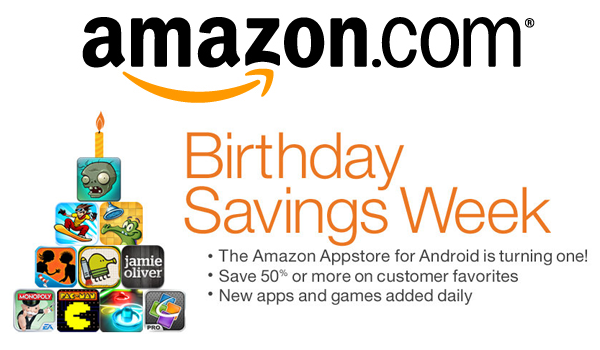 Amazon is celebrating the first anniversary of their Android app distribution model, Appstore for Android. Starting today and running for a week, Amazon will be offering up some pretty terrific deals on apps and games for Android. For instance, today sees Plants vs. Zombies going for 99¢, a savings of 67% off the normal cost. Day two will see a pair of new promotions and day three will be a trio of apps, and so on and so on. In addition to a bunch of discounted applications and games, Amazon is also giving away eight Kindle Fire tablets. The sweepstakes runs through the end of the month and all the details can be found on www.amazon.com/appstorebirthday. Finally, Amazon has released a list of the top-selling and most-downloaded applications from the Appstore over the last twelve months. While many of the titles we see here reflect the Android Market’s popular apps, Amazon will occasionally shave a decent percentage off the games or applications. If you’re in the market for one of these paid apps then we suggest checking Amazon Appstore first to see if it’s on sale. Amazon Appstore for Android is celebrating its first birthday with a week of deals on some of its customers’ favorite apps and games, including iconic titles such as Fruit Ninja, Wolfram Alpha, Splashtop Remote Desktop, Dr. Seuss’s The Shape of Me and Other Stuff, TuneIn Radio Pro, TETRIS, PAC-MAN, The Lost City, MONOPOLY, AccuWeather Platinum and Jamie Oliver’s 20 Minute Meals. Birthday deals start today with one of the top paid apps, Plants vs. Zombies, at 67 percent off. Tomorrow, Amazon will announce two more app deals. On day three, three more new app deals will be revealed and so on for the remainder of the week-long celebration. Also starting today, the Amazon Appstore kicks off its Amazon Appstore for Android Birthday Giveaway and will award a Kindle Fire to eight lucky winners who enter the sweepstakes by March 31. * For more information and for all birthday deals visit www.amazon.com/appstorebirthday. Customers can use Amazon’s Test Drive feature to test out apps before buying. Once they download an app they can use it across multiple devices, including Kindle Fire, giving developers a new platform for reaching customers. “As Pandora continues our mission to provide people with personalized music they love, being a featured app on Kindle Fire has given us an exciting new platform to connect with our listeners, both existing and new, and we’ve been impressed with the high engagement rate we’ve seen on Kindle Fire,” said Simon Fleming-Wood, chief marketing officer of Pandora Media. “At Quickoffice, we’ve experienced a massive lift in our Android app sales since the launch of Kindle Fire. The Amazon Appstore has been a great showcase for our app, and we’ve seen significant gains in conversion rates compared to other app stores based on the integrated Amazon buying experience,” said Alan Masarek, CEO of Quickoffice, Inc.
Amazon Appstore has grown its selection nearly eight-fold since launch, from 4,000 apps to over 31,000. In its first year, the most downloaded paid app in the Amazon Appstore was Cut the Rope, followed by Angry Birds (Ad-Free) and Where’s My Water? ; the most downloaded free app was Angry Birds Free, followed by Netflix and Solitaire by MobilityWare. Amazon Appstore offers a paid app for free every day. If a customer had downloaded every Free App of the Day since launch, they would have saved nearly $1,000. The paid app with the most 5-star reviews in the first year of the Amazon Appstore was Where’s My Water?, with over 3,000; the free app with the most 5-star reviews was Blood & Glory, with over 4,000. In the Amazon Appstore’s first year, customers spent more than 7,700,000 minutes test driving apps; Bubble Buster was the most test-driven app, followed by Amazon MP3 for Android with Cloud Player and Memory Trainer. Over the past year, the most popular app category for customers is games, followed by entertainment and productivity. Some of the most popular apps include Angry Birds, Fruit Ninja, Netflix, Hulu, Pandora, QuickOffice Pro, CalenGoo and Exchange by TouchDown. For more details and to find all deals that are part of the birthday celebration, visit www.amazon.com/appstorebirthday or follow the Amazon Appstore on Twitter (@amazonappstore). *After 10:00 a.m. (PT) today, visit the Amazon Appstore for Android Facebook page at www.facebook.com/amazonappstoreforandroid to learn more about the Amazon Appstore for Android Birthday Giveway and to enter for a chance to win. See the Official Rules at www.amazon.com/AppstoreBirthdayGiveaway. There is no purchase necessary to enter. The Amazon Appstore for Android is where customers can find, discover and buy thousands of apps using Amazon’s convenient and trusted shopping features. Customers can access the store directly on Kindle Fire, from any computer, or on an Android phone or tablet. Amazon Appstore has a broad selection of paid and free apps and games, including established best sellers and new apps from top-tier brands. There are over 31,000 apps in the store and more apps and games are added all the time. Plus, the Amazon Appstore offers customers a great paid app for free, every day. Amazon.com, Inc. (NASDAQ:AMZN), a Fortune 500 company based in Seattle, opened on the World Wide Web in July 1995 and today offers Earth’s Biggest Selection. Amazon.com, Inc. seeks to be Earth’s most customer-centric company, where customers can find and discover anything they might want to buy online, and endeavors to offer its customers the lowest possible prices. Amazon.com and other sellers offer millions of unique new, refurbished and used items in categories such as Books; Movies, Music & Games; Digital Downloads; Electronics & Computers; Home & Garden; Toys, Kids & Baby; Grocery; Apparel, Shoes & Jewelry; Health & Beauty; Sports & Outdoors; and Tools, Auto & Industrial. Amazon Web Services provides Amazon’s developer customers with access to in-the-cloud infrastructure services based on Amazon’s own back-end technology platform, which developers can use to enable virtually any type of business. The new latest generation Kindle is the lightest, most compact Kindle ever and features the same 6-inch, most advanced electronic ink display that reads like real paper even in bright sunlight. Kindle Touch is a new addition to the Kindle family with an easy-to-use touch screen that makes it easier than ever to turn pages, search, shop, and take notes -– still with all the benefits of the most advanced electronic ink display. Kindle Touch 3G is the top of the line e-reader and offers the same new design and features of Kindle Touch, with the unparalleled added convenience of free 3G. Kindle Fire is the Kindle for movies, TV shows, music, books, magazines, apps, games and web browsing with all the content, free storage in the Amazon Cloud, Whispersync, Amazon Silk (Amazon’s new revolutionary cloud-accelerated web browser), vibrant color touch screen, and powerful dual-core processor. Amazon and its affiliates operate websites, including www.amazon.com, www.amazon.co.uk, www.amazon.de, www.amazon.co.jp, www.amazon.fr, www.amazon.ca, www.amazon.cn,www.amazon.it, and www.amazon.es. As used herein, “Amazon.com,” “we,” “our” and similar terms include Amazon.com, Inc., and its subsidiaries, unless the context indicates otherwise.